Published October 31, 2018 at 661 × 432 in TORONTO’S LARGEST FISHING HOLE IS GRENADIER POND IN THE WEST END’S HIGH PARK. Series consists of a portfolio of photographs taken by Ben Mark Holzberg showing Grenadier Pond and adjacent locations in High Park. The portfolio includes 182 born-digital photographs, and twenty-four photographic prints, which were selected from the larger group of digital files by the artist for printing. The photographs were taken during different seasons and show subjects such as ice-skating on the pond during the winter, flowering cherry trees in the spring, great blue herons and other wildlife enjoying the pond during the summer, and beautiful trees in full fall colours during the autumn. Holzberg took his pictures from various vantage points, including from the air while in a small plane, from the pond while in a boat, and on land from the shoreline of the pond and vicinity. Most of the images do not include people, instead focusing on the natural world of water, wetlands, trees, and birds. 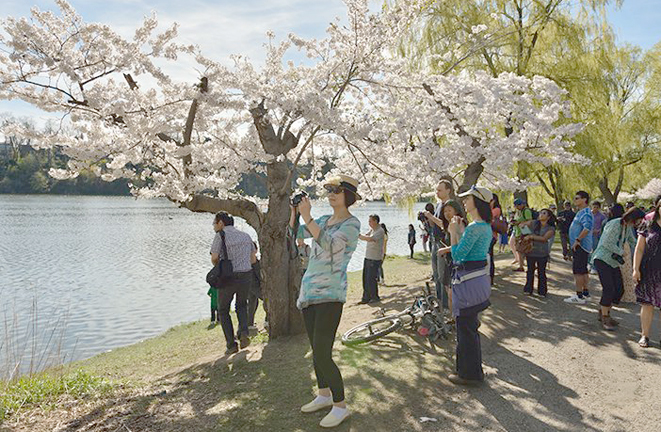 However, there are some images showing the crowds who descend on the park every year to take pictures of the cherry blossoms, and other views of people jogging, sitting in the sun, and playing ice hockey. The photographs show the park and pond in intense, saturated colours, expressing the creator’s deep appreciation for this pocket of nature in the middle of Canada’s largest city.